CLIP your line to the front attachment hole of a vibrating blade to produce the tightest vibration and make the lure run deepest on the retrieve (top). Connect the line to the rear hole to produce the widest wobble and make the lure run sha1lowest (bottom). LOCATE lake tfout in deep water with a vibrating blade. After jigging vertica1ly on bottom, reel the lure rapid1y upward. Stop to jig every 10 to 20 feet. Lakers often follow the lure, striking near the surface. enough to make the blade vibrate. 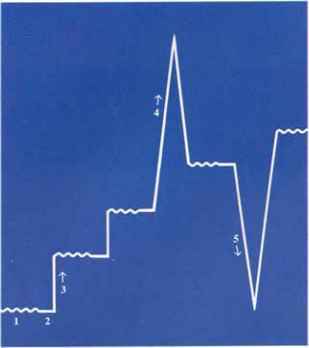 To detect strikes, (3) keep your line taut as the lure sinks. Continue hopping the blade, using longer sweeps than you would with a jig. REPLACE a bent or rusty hook with a new split -eye hook By placing the free end of the eye into the attachment hole, then twisting the hook (arrow) to close the eye. Or, substitute a split-ring and a standard treble. Originally, the tailspin was designed for bass fishing in southem reservoirs. But many fishermen have found it effective in northem waters for bass, wa1l-eyes and even lake trout. 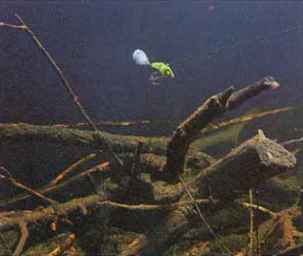 Because the spinner blade on the tail tums while the lure is moving forward or sinking, it provides constant flash. The blade slows the sink rate, so fish baye plenty of time to strike. You can jig a tailspin vertica1ly a1ongside cover like standing trees and bridge pilings, or a1ong steep structure like cliffs and submerged creek banks. Or, you can jig it vertically while drifting with the wind or current. Because of its aerodynamic shape, a tailspin excels for long-distance casting. Many reservoir fishermen carry an extra rod rigged with a tailspin in case a school of largemouths, white bass or stripers suddenly breaks the surface. 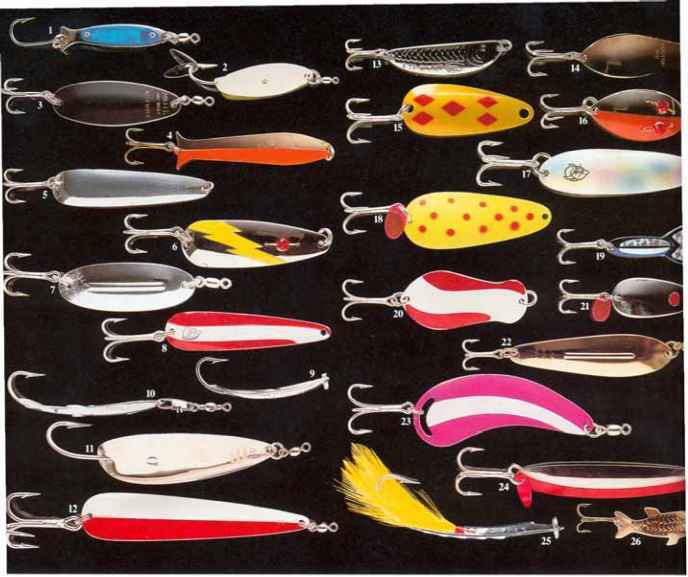 Fishermen use tailspins weighing from 1/4 to 1/2 ounce for white bass and crappies; % to 3/4 ounce for largemouth, smallmouth, and spotted bass; and 3/4 to 1 ounce for stripers. ATTACH a tailspin by tying your line directly to the eye. No snap or swivel is needed, because the lure does not wiggle or spin. HG a tailspin vertically as you drift with the wind. Raise the rod just fast enough to feel the beat of the spinner blade. Keep the line tight enough so that you also feel the beat while lowering the lure. As you drift, adjust the line length to keep the lure close to bottom. rapidly so the lure does noi sink below ihe fish. When you no longer see fish breaking the surface, ihe school has probably sounded. If this happens, let the lure sink a few seconds before starting your retrieve. WALK a tailspin down a cliff to catch largemouth and spotted bass. Cast as close to the cliff as possible and let out line until the lure bumps a ledge or rock. Then, pull sharply to lift the lure, release line and lower it again. REEL a tailspin steadily, just fast enough to keep it above bottom obstructions like logs and brush. The spinning blade provides enough oo so the lure can Be retrieved slowly without plummeting to bottom. Veteran ice fishermen know that lures jigged vertically will often produce more fish than live bait. 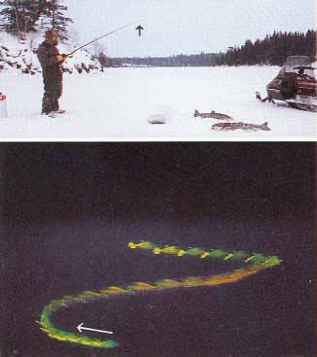 The jigging action seems to draw strikes from fish that are inactive because of the near-freezing water. SIDE-PLANING LURES. These lures are designed to dart sideways or move in a wide arc. 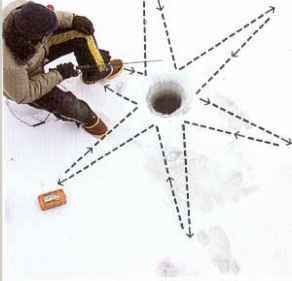 This makes it possible for the fisherman to cover a much larger area than he could with live bait or other lures. 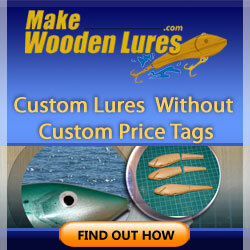 Side-planing lures work well for walleyes, northern pike, crappies, white bass, and most species of trout. A jigging minnow has a cylindrica11ead body with a sing1e hook molded in each end, a fin at one end and an attachment eye in the middle of the back. When you pull upward, the fin causes the lure to swim to the side. Jigging minnows should be tied directly to the line. 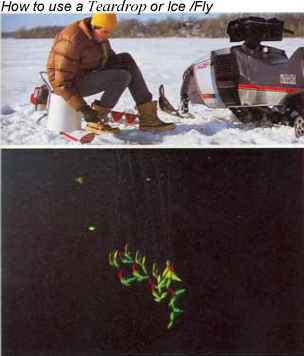 Jigging spoons designed for ice fishing are similar to those used in open water, a1though most are smaller and narrower. These lures have llttle action when pulled upward, but tumble to the side when allowed to sink with slack line. Ang1ers often tip these lures with whole or cut minnows, or fish eyes. 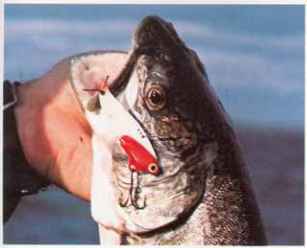 Jigging spoons should be attached with a split ring. An airplane jig is simply a lead-head jig with wings molded into the sides of the head. 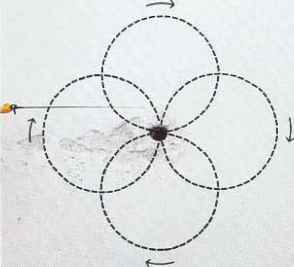 The lure swims in a wide circle when jigged. Tipping with minnows usually makes these lures more effective. Airplane jigs should be tied directly to the line. TEARDROPS AND ICE FLIES. These tiny lures are intended mainly for panfish. Teardrops get their name from the shape of the body, a1though many are disc-shaped or round. A typical teardrop consists simply of a painted lead body.molded around a #8 to 12 fine-wire hook. ICe flies have a sma11 1ead body dressed with hair, feathers or rubber legs. The dressing gives a lifelike appearance and adds action when you jig the lure. Teardrops and ice flies norma11y work best when tipped with live bait such as waxworms, mousies, silver wigglers, goldenrod grubs, small minnows ar worms. Some teardrops coTe with soft plastic bodies that imitate grubworms. Two in One, (16) Tally, (17) Barbless Purist, (18) MiniGrub, (19) Chippy, (20) Jiggly, (21) Purist, (22) Tear Drop, (23) Ball-O-Fire, (24) Live Bait Bug, (25) Daphnia, (26) Moon Glitter, (27) Mim Ditzi, (28) Zip Minnie, (29) 3-D, (30) Carlson, (31) [email protected] Ant, (32) Timberwolf, (33) Bomber, (34) Rub-R-Legs, (35) Do Doo, (36) Skin Yas. PULL a jigging minnow sharply upward with a twitch of your rod. Tbe line will move to one side of the hole, then gradually settle back. Wait for the line to stop moving, then give another sharp twitch. SWEEP your rod upward to make an airplane jig move in a circle. Aspinning or casting rod e^bles you to make a sweep aslong as 10 feet. Let the lure settle, pause a.few seconds, then make another sweep. DROP the rod tip rapidly when using a jigging spoon. With slack line, the lure will flutter enatically downward and to the side. 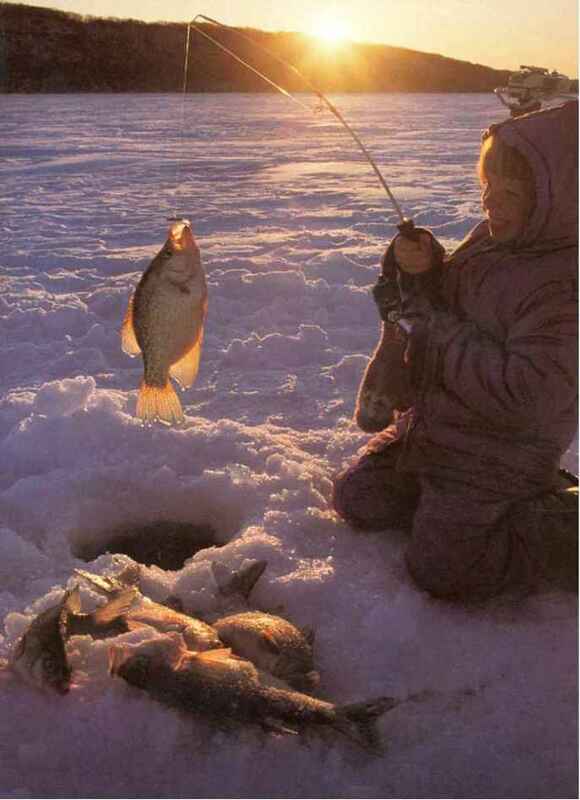 Wait for your line to settle, lift the lure a few feet, then drop it again. KEEP jigging so that the lure moves around the hole in changing circles. 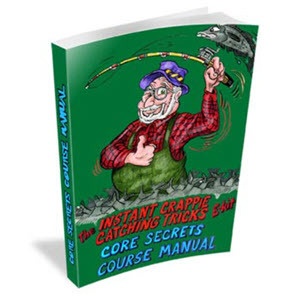 For lake trout or other fish that suspend, start jigging near bottom, continue a minute or two, then move the lure upward at 10-foot intervals. PAUSE for severa1 seconds after the lure has settled when using a jigging minnow or spoon. Most fish strike after the lure stops moving. Many anglers work the lure too rapidly, not pausing long enough for fish to strike. JIG a teardrop or ice fly using a short, flexible jigg1estick and 2- to 4-pound-test line. Many experts prefer a spring on the rod tip, caIled a spring bobber, to a standard float. The spring helps detect subtle strikes. 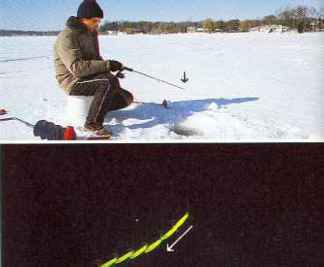 CONTINUE working a jigging minnow or spoon so that the lure covers the entire area around the hole (dotted lines). Both lures move outward in a slightly different path with eacb jigging stroke, then settle back to center. LOWER the lure to bottom, (1) jig it gently for a few seconds, then (2) pause. (3) Lift it a short distance, jig, then pause again. Continue lifting and jigging. Occa-sionaIly (4) sweep the lure higher or (5) let it drop. Spoons spoon catches more water and thus wobbles more widely than a flatter spoon. Thin spoons tend to wobble more than thick ones. The flashy, wobbling motion of a spoon imitates that of a fleeing or crippled minnow, triggering strikes from most species of gamefish. Spoons work best for large predators like northern pike, muskies, largemouth bass, salmon and trout. Because spoons appeal mainly to the sense of sight, they work best in relatively clear waters. 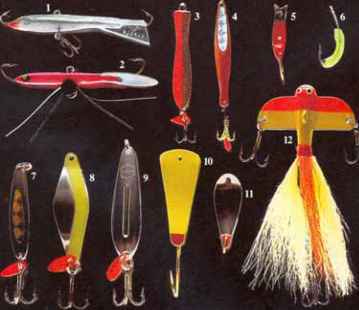 The long-standing popularity of spoons results not only from their nearly universal appeal to gamefish, but also from the relative ease of using them. 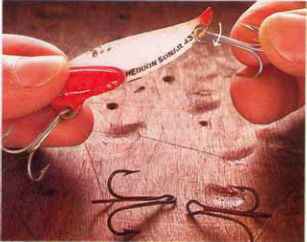 Anglers normally fish spoons far enough above bottom so that snags are not a problem. And a fish usually hooks itself when it grabs a spoon. Spoons are generally made of hard metal, either steel or brass. A few are made of tough plastic. Because one side is concave, a spoon catches water when retrieved and wobbles from side to side. But thick spoons have some advantages. The extra weight makes them cast better, sink faster and run deeper than thin spoons. Most spoons have a polished metal surface on at least one side. Sunlight reflecting off this surface makes the spoon visible for a long distance, especially in clear water. Some spoons have a hammered surface that scatters light in all directions, much the way the scales of a baitfish scatter light. High-quality spoons sometimes have a plated surface that reflects more light than the duller surface of cheaper spoons. Spoons fall into three basic categories. Standard spoons include any non-weedless spoon heavy enough to cast. Trolling spoons are so thin that they are not practical for casting. Most standard and trolling spoons have a single or treble hook attached to one end with a split-ring. Weedless spoons usually have some type of weedguard to prevent the fixed single hook from fouling in weeds, brush or debris. The main consideration in fishing a spoon is how fast you work it. A spoon will not wobble properly if fished too slowly or too fast. You must experiment to find the precise speed at which each spoon performs best. Most anglers prefer light- to medium-power spinning or bait-castingtackle when fishing with spoons. Ultra-sensitive rods are not necessary. Because fish tend to hook themselves on spoons, you need not be concerned about detecting strikes. Spoons work best when fished with light monofilament. Heavy line restricts the wobble and is more visible to fish in clear water. 115 about as long as the baitfish's body excluding its tail. How to connect artificial lures? How to fish a fft lure ? 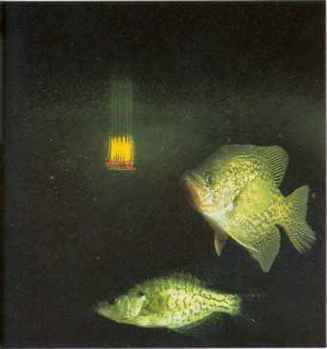 How to mount artificial grub on weedless hook for crappies? What is the airodinamics of a sinking bass lure? When was the red eyed wiggle first made? How to make lure eyes? How to fish the airplane jig? Who makes russian fishing lures? What spoons are good for lake trout? Is the snap or swivel attached to lure? 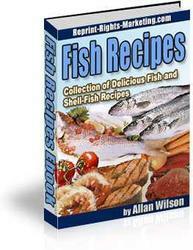 How to make artificial bait? How to use russian hooks? How to make artificial minnow? 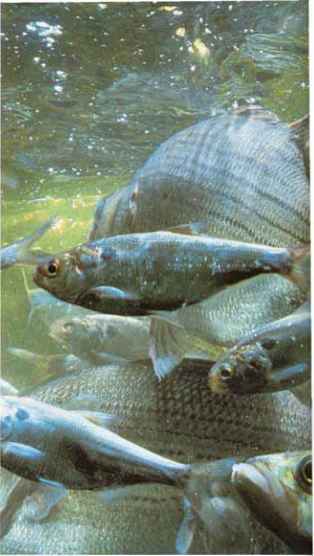 How to make artificial bait for fishing? What size and style single hook do I need fro spoon fishing in timber?